Carpet comes form the old Italian carpita, meaning to pluck. The term rug was not always used to refer to a fabric to cover the floor, they used it even more for wall covering and table cloth. As a wall covering it was used to insulate the walls, keeping the cold outside as not every room would have an open fire place to warm the space. Only in the 16th century they started using the word rug as we know it these days. Making a rug can take months, from dying the yarn till finished product. The most traditional type of rug is the oriental rug, which is the knotted one. 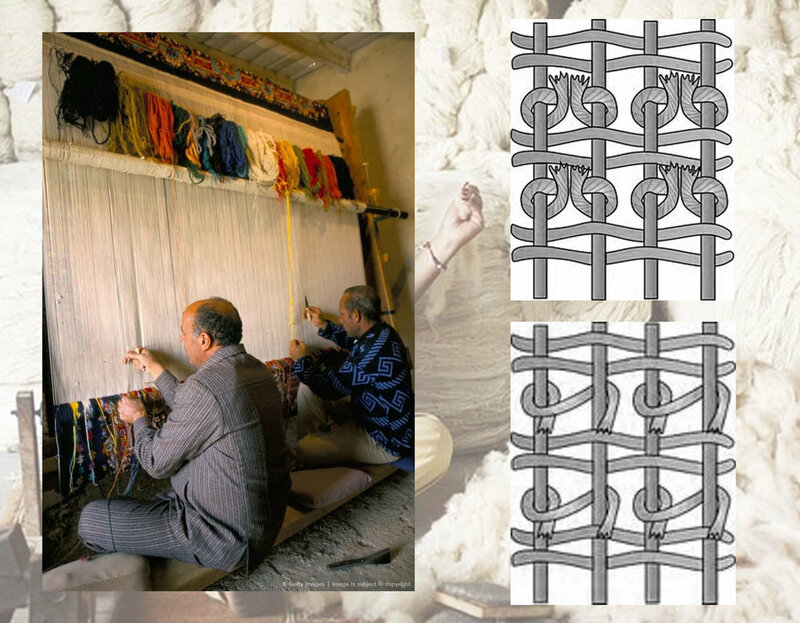 There are several types of knotting but the two most important types of knots are the Turkish knot and the Persian knot. The Turkish knot is symmetric, the Persian one is asymmetric , open to the right. The knotting is done by hand, on vertical or horizontal looms. Often a number of weavers will work together on the same rug, sitting one next to the other. The rug will be made in wool, silk or a combination of both. Wool is a fiber which will give a mat effect, the silk rug will be shiny. Imagine which a beautiful effect can be obtained when combining both fibers and have a play of mat and shiny. A weaver can make about 8000 knots a day. When you know that a high density wool rug will have 160 KPSI (knots per square inch) and a high density silk rug 645 KPSI, than you can start counting and you will soon understand why it takes so long to make a rug. And next time when you think a hand-knotted rug is expensive you will know why. Oriental rugs are in general very classical and come in dark classical colors. But there is a trend to use them in modern homes. The combination of classical rug and modern furniture is very refreshing. Designers are giving also a modern twist to this type of rug. Take a look on the video here under of Jan Kath. He will take a classical rug and erase a part of the design. Or give a fresh look to traditional rugs, such as his collection "With Love from Russia"
We all know the oriental flat woven rugs, kilim, from Turkey and Morocco. They can be used decorative, or as a prayer rug. Modern kilims are quite popular as floor coverings in bohemian style interiors. Many motifs are used in the Turkish kilims, they are filled with symbols, all with their own meaning. Some to bring prosperity, others are symbol for motherhood and fertility, some to ask for safety and much more. Moroccon killims have more geometrical motifs. The oldest records of flat woven kilims are from 7000BC. The kilim is woven on a loom quite similar to the ones to weave fabrics. The colors will be intense but never very bright. The yarns are often dyed with vegetable dyed. Golran started a few years ago a trend when buying old rug, de-colorizing and over-dying them afterwards. Each rug is a piece of art and not two of them will be the same. Different suppliers got inspired and now you can find easily this type of rug in she shops. One of my favorite type of rugs is the traditional Beni Ouarain rug. These traditional Berber rugs were made by the Beni Ouarain tribes, who lived in Morocco's Atlas Mountains. They use the undyed wool from a special sheep. These smaller sheep are an ancient breed, and they produce excellent high quality wool. They are super comfortable, and will be appreciated by those who love natural materials. All the Beni Ouarain rugs typically have geometric designs. You can also expect to see some symbols,they will tell the true story of the weaver's life. A Beni Ouarain rug will fit in different styles. It will bring warmth to a Scandinavian room, give an artistic touch to a bohemian interior and will be even the perfect match in a minimalist home. A carpet, going from wall to wall, can be used to make the room more comfortable. It will bring an extra feeling of luxury, specially in bedroom rooms and walk-in dressing rooms, rooms where you will enter bare feet. It comes in a range of qualities, different price ranges. You will find simple plain colored carpet, small structures, loop weave. For those who love more classical approach they can use small design patterns in classical color range. This type of floor covering can be a nice for the kids' room, as it is soft, for when a toddler will play on the floor. A good solution in offices to reduce the sound from walking, particularly in old buildings or apartment building. Carpet can create the feeling of being in a hotel. Don't forget to use an under-layer when installing a carpet or a runner on the staircase as it will give you that little bit of extra comfort. Buying a rug is always an investment, but remember that you can keep a good quality rugs for years. Rugs as well as carpets come in different fibers, colors, and depending on your budget you will find a beautiful piece. Running out of budget? Get inspired by the rugs Paola Navone painted on the floor of her summer house in Greece.